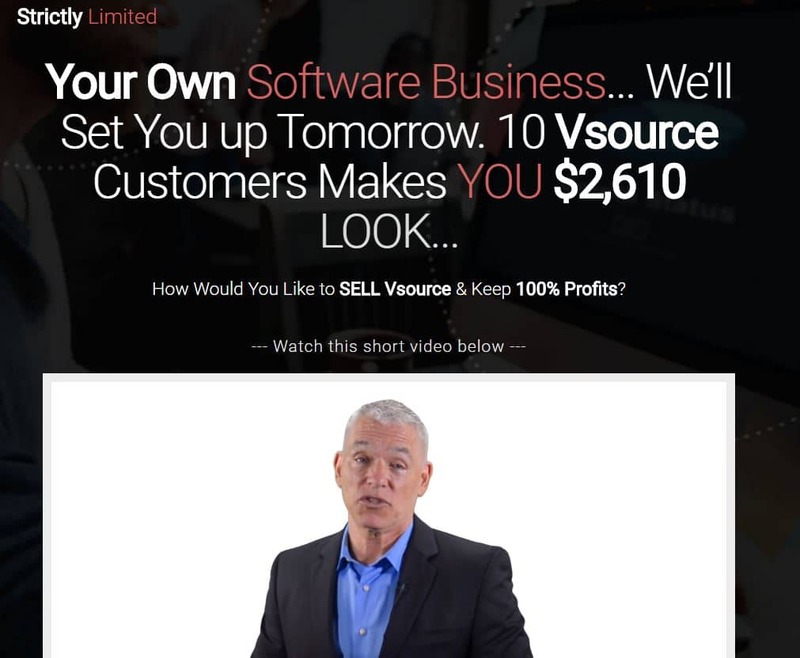 VSource Review: Can Mark Bishop Help You Make Quick Cash? Damn, not to make small talk or anything, but it’s perfect review-writing material in rainy ol’ New Zealand. It’s 5 pm, I’ve got my cuppa ice water next to me, and I’m ready to hand out your dose of honest, authentic, integral reviews. Today, I’ll be going through VSource by Mark Bishop. Mark claims that this is some new, groundbreaking software that allows you to take other people’s traffic and content legally, and create “commission sucking affiliate sites” from it. 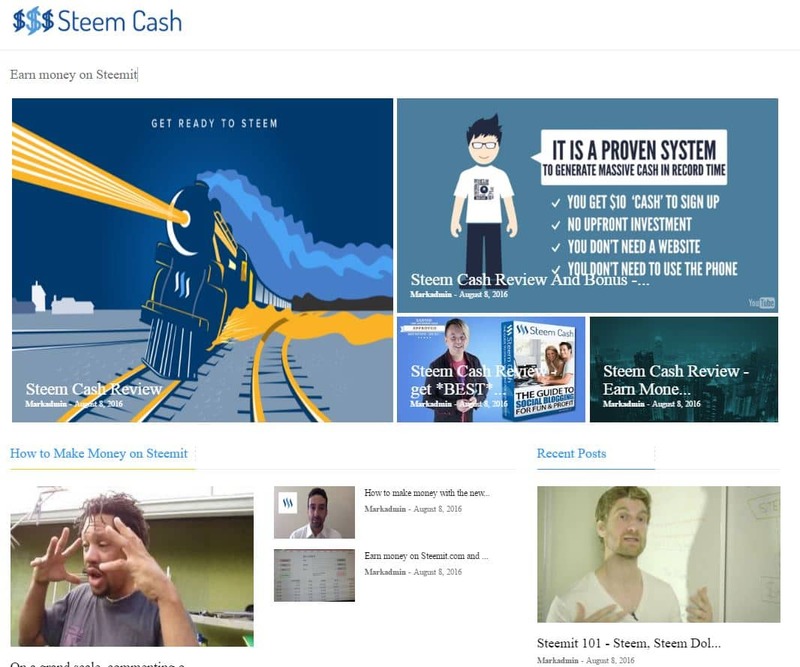 He even goes as far to say “Instant Free & Targeted Traffic… Complete Site Construction in 6 Minutes… Ranked in Days… Profit in Days… And next to ZERO work.” He also claims that this system requires no internet marketing experience, list, content, or even product. 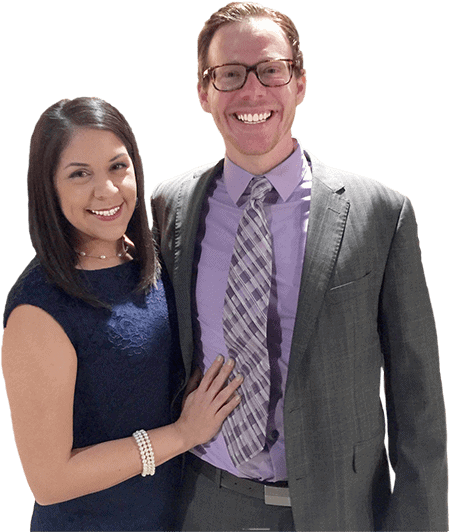 The last claim that I’ll say is that Mark claims you can make hundreds of dollars per week from someone else’s traffic, content, and product – all totally legal ! 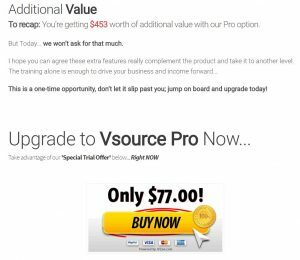 Sounds a bit too good to be true if you ask me – a profitable business in minutes, with little to no work, and using somebody else’s traffic, content, and even products. Let’s see if Mark Bishop’s product lives up to its sales claims. FYI – Before we get into the review, I’d thought I’d let you know that none of the reviews here at Stopping Scams are influenced by a paycheck. The fuel that keeps this business running is honest reviews. If there’s ever a product that’s terrible, delivers no value, and is a complete waste of your time and money (which is roughly 80% of the products we review), then we’ll do our best to completely decimate the product and entertain you along the way with our witty writing humor. 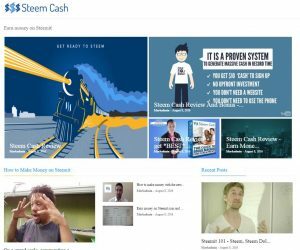 On the other hand, if we ever come across an absolute gem that educates, delivers value, and shows you the ins and outs of making money online, we’ll let you know about it. With that being said, let’s get into the review. I’ll be completely honest- this is the first time that I was ever baffled by the way the system works. It seems like an entirely legal way to use other peoples content and traffic to generate some dosh. However, I don’t believe it’s a long-term way of running a profitable online business, and I think that this system will EASILY get completely stomped by another internet business with a more long-term approach. This system seems more suitable for the later 90’s/early 2000’s, not as a reliable, sturdy approach to internet business in this day in age. Your money and time are better invested elsewhere. 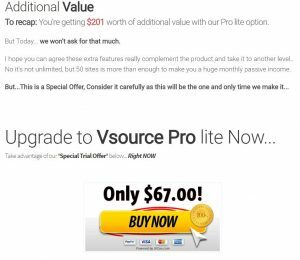 As always, I encountered more than a few upsells and down sells after the initial purchase of VSource. It honestly didn’t look like anything too special; just a bunch of extra add-ons that aren’t necessary and are a good way for Mark to make an extra buck or two. 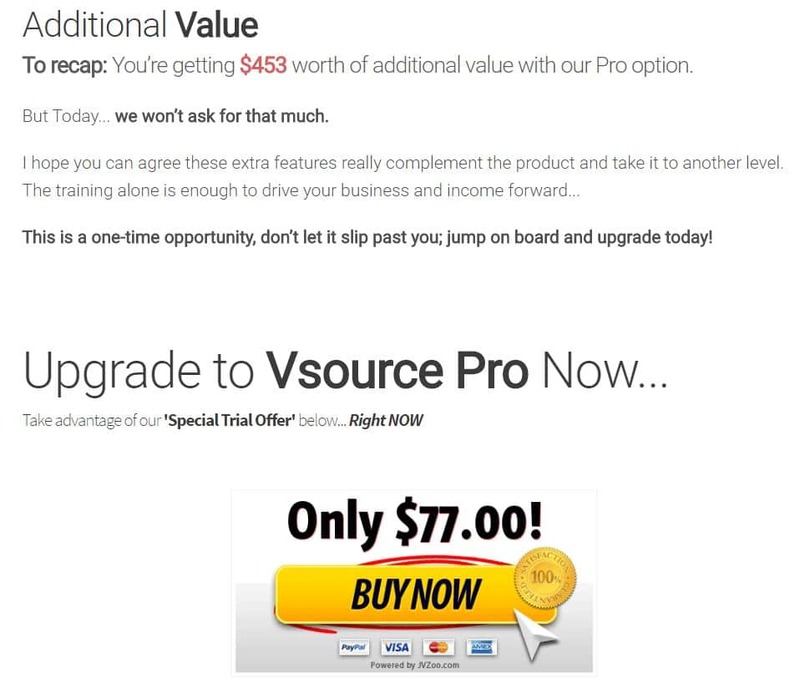 Whether the upsells ACTUALLY deliver quality content and training, I wouldn’t know because I didn’t buy them. But generally, they’re not as good as the fancy man on the sales video says they are. I skipped the upsells, and was taken to a membership site that looked a little something like this. I dove into the training, and I was extremely surprised at how novel the VSource System money-making method really was. 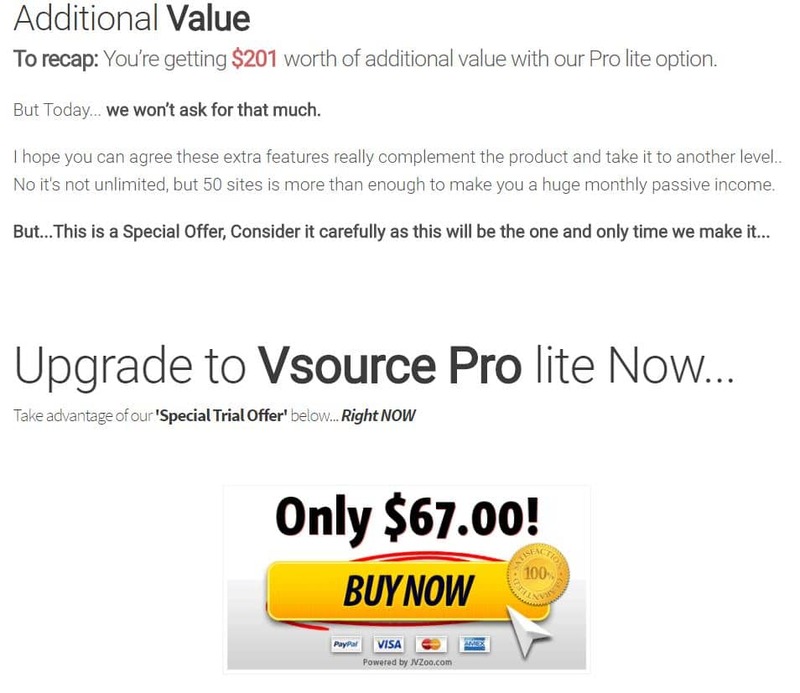 So I’m making it as simple as possible – to make money from VSource, pretty much you have to find domains with broken links (with the help of their software), buy the domain name, set up a quick little site that takes a particular type of content from other people, and hope that people buy whatever product you’re offering on the site. Sounds complicated? I’ll take you through a quick little walkthrough. 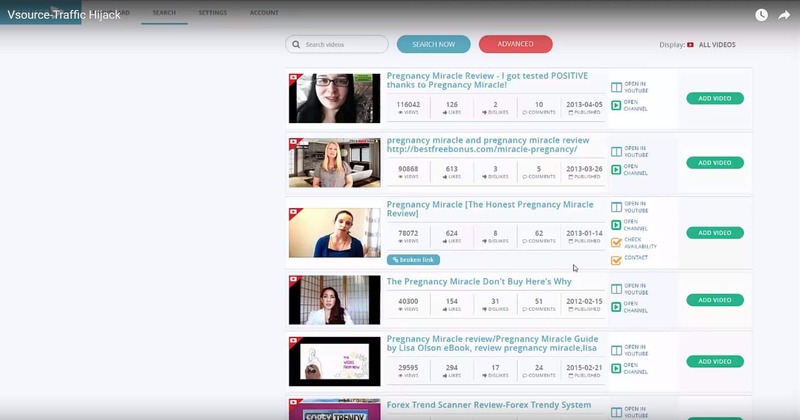 Mark Bishop uses the product called “Pregnancy Miracle” as an example. 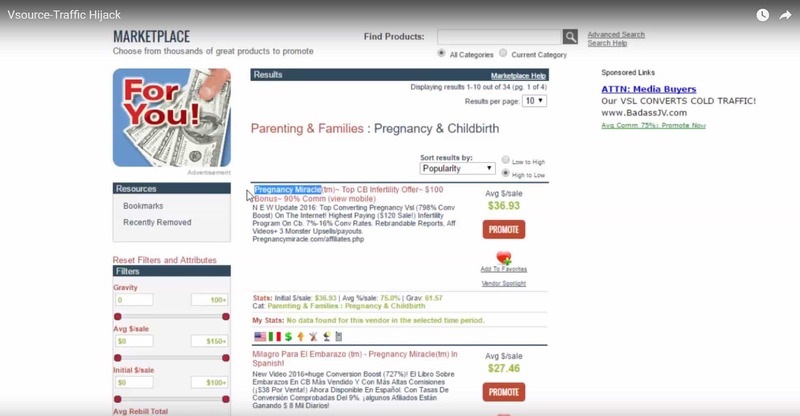 Once he’s chosen a product, he does a search on the VSource Software to look for videos in relation to the product that he’s chosen. He then checks to see if the domain is available for the broken links and if it is, he says it’s good to purchase and start creating a site around. Then, it’s all about creating a site that ranks for the keyword of your choice (usually something like “product name + review”). He says all you need to do is install the VSource theme, find a list of videos to use as content for your site, and chuck it up on your site. There’s not much information about how to set up a word press and domain-forwarding and all that jazz just so you’re aware. But, apparently, once you’ve got this sussed, you’re in business. The process makes sense, right? If that’s the case, then why can’t I recommend this product to you guys and gals? Check the site out, and ask yourself “would a person actually buy something off of a site like this?” I’m sure we can safely agree that the answer to that is a firm, solid no. Like I said, I’ve heard stories about niche-specific sites like these being hugely successful back in the late 90’s and early 2000’s when the internet was still finding its place in the world. But nowadays, internet users have developed a keener eye for crappy little sites like this, and understand what spam is and know the ways to get around it. With that being the case, the majority of TRUE internet business’ are sites that have developed a brand, a loyal following with their clients, and have delivered massive amounts of value to them in the process. I mean, even take a look at Stopping Scams for example. Everything about this site screams legitimacy. A neatly designed site to go along with the tremendous amount of valuable content helping tons of people stay away from crappy internet marketing products. 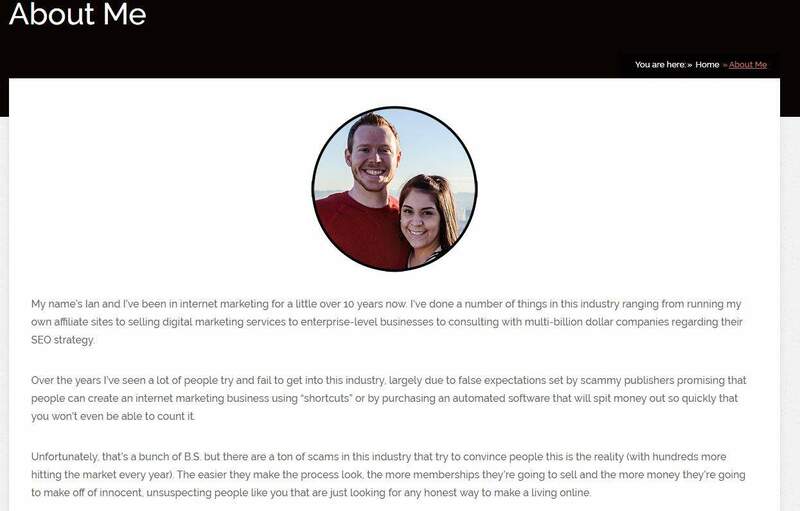 It even has an “About Me” page with big ol’ Boss Ian and his wife, explaining his journey and experience with internet marketing. Ultimately, what I’m trying to say is that internet users aren’t stupid anymore. 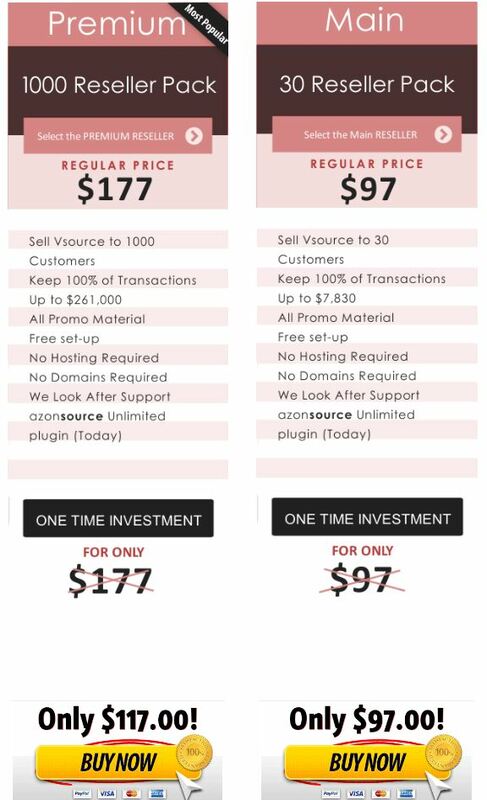 A long-term, fundamentally sound internet business like Stopping Scams will spank the undies off of any niche-specific site like the types created using the VSource Method. The only reason why I’m giving this a C+ is because of how innovative the method is. Seriously, that’s the first time I’ve ever seen someone make sites that way, and checking the domain links to find the “broken” ones, taking the traffic, and sending it to a site you’ve created yourself. That’s some mad scientist material right there. But it’s not a fundamentally sound way to build a legitimate business that would help people escape the 9 to 5 job, and live on something with a bit more freedom. Remember, if any of you guys or gals have ANY questions in relation to Internet Marketing, one of us here at Stopping Scams will do our best to help you. I’ve had a tiny bit of experience with this stuff – I started my IM journey by ranking people up in a game in exchange for money, and moved my way to writing content. Ian, on the other hand, is a lot more qualified than I am; he’s mentoring me at the moment, and after all the help I’ve received from him, I know he’s the type of person who truly puts other people’s needs before his own. Have a beautiful day yall! 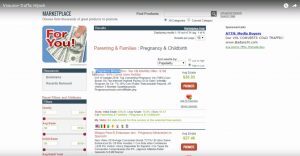 Mark Bishop’s Bingy Review: Can This Rank Your Site on Page 1 Without Penalties? Mark Barrett’s 7 Dollar Tsunami Review: Real Deal or Crappy? Art Flair’s FLIPP me Review: Is It the Long-Expected Break? Digital Altitude Review: Can Michael Force Make You Rich? Have you had a chance to check out Blox yet? It’s Mark Bishops new product. I’m thinking of buying it. I have not, unfortunately. We focus more on publishing really high-quality, free training these days rather than product reviews. Ultimately, free, high-quality education is probably the best way to prevent people from getting scammed. No, I highly recommend you for not buying it. I have bought the Blox main course and think it is a total waste of $17 that I have paid. It also has lots of upsells. The idea that he’s selling is actually- to promote your free magnet and in order for people to get the free magnet, they have to buy a product from your affiliate link. I have learned from my mistake and will never ever buy scammy products ever again. The best way is to go through FIMP’s free training-totally worth it.